While children’s films based on adaptations of bestsellers enjoy considerable success in German cinemas, films featuring original content are few and far between. Yet initiatives have been launched to change this. Children’s films have been extremely popular with German cinema audiences for years. 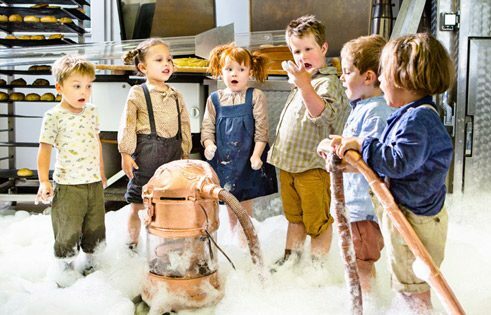 According to the German Federal Film Board, seven films for children made it into the top 20 most successful German cinema productions in 2014. However, the German children’s film hits are for the most part adaptations of popular brands – children’s books, comics, audio plays, television series or media figures. Famous Five 3 for instance is based on the books by bestselling author Enid Blyton, while Bibi&Tina – Der Film is an adaptation of the popular series of children’s audio plays of the same name. Both film adaptations aim to provide fun and entertainment for the entire family and attracted audiences of over a million in 2014. Smaller, less mainstream children’s film productions featuring original content are rarely screened in German cinemas, however. One of the reasons presumably has to do with financing: the popularity of an existing publication on which to base the screenplay increases the chances of getting the green light from the investors – the film funding organizations and television channels. After all, they assume that adaptations of known content will reflect the preferences of German audiences, enabling them to compete with their US rivals and their high marketing budgets, and to recoup their costs. It is therefore difficult to find backers for original content. And yet it is precisely such films which actually dare to broach awkward issues and employ unconventional narrative techniques, pick up on topical problems and consistently explore difficult subjects from a children’s perspective. Nonetheless, it is too rarely the case that highly committed filmmakers such as Helmer are able to persuade television channels and film funding institutions to give films with unconventional content a chance. That is why media educators and associations such as the Förderverein Deutscher Kinderfilm, an association which promotes German children’s films, has been criticizing the one-sidedness of German children’s film productions. They complain that bestseller adaptations geared primarily to profits and audience ratings do not reflect the reality of life for the ten million or so children and young people in Germany, claiming that there is a risk that the range of films will become more narrow and the cultural education of young adults will become impoverished. “Besides film adaptations of classic children’s books, we also need original content, for the future of children’s film lies in diversity”, stresses Hans Strobel, the former director of Kinderkino München and one of the people who for decades has been dedicated to promoting German children’s film. All it takes to see how things can be done better is a quick glance across the border. Traditionally, there has always been a particularly high appreciation of films for children in the Scandinavian countries. In Denmark for example, a law was passed in 1982 that stipulated that 25 percent of state film funding resources had to be spent on films for children and young people. This is the sort of minimum quota that German filmmakers can only dream of. What is more, because the markets in the individual Nordic countries are small, filmmakers tend to join forces and co-produce their film projects. For years this has given rise to high quality children’s films which regularly win awards at international festivals. The Netherlands has also improved significantly in this respect, thanks above all to a sustainable funding policy. In February 2012, following the Scandinavian model, the Berlin Film and Television Association submitted a petition to the Bundestag to alter the German federal film funding act. The Bundestag was accordingly called upon to pass a resolution that one quarter of the budget of federal film funding be exclusively reserved for independently produced German children’s films and to suspend the German Federal Film Board’s profitability criteria for these films. The criticism of the undesirable development of children’s film in Germany has had an impact: among other things, 2012 saw the establishment in Berlin of the initiative Der besondere Kinderfilm (i.e. the special children’s film), an association of public service broadcasters, film funding organizations and producer and industry representatives. Its goal is to help children’s film in Germany to achieve greater diversity with original content and contemporary stories. In a two-stage funding model, at least two projects are to be selected, developed and produced each year. The initiative is making good progress: its first film production, Winnetous Sohn by André Erkau, was released in German cinemas in April 2014. The number of funded projects has also risen: three film projects from the second year of the initiative with a total budget of ten million euros have already been shot or are to be shot in 2016. As Karola Wille, artistic director of regional broadcaster MDR and co-founder of Der besondere Kinderfilm, explained, the initiative is “not an alibi association but a convincing alliance to support children’s film”. Another initiative has also been set up: in February 2015, the Mitteldeutsche Medienförderung and the Netherlands Film Fund founded a Co-development Fund with an annual budget of up to 100,000 euros to promote original film screenplays dealing with contemporary issues for children and young people. Will these two projects be enough to improve the situation? The Filmotter initiative for more diversity in children’s film calls for “five independent films per year!” It claims that children have the same right to diversity as adults, and should not have to accept only blockbusters. Reinhard Kleber is a film-fan and journalist based in Bonn.